The Snom A210 WLAN-Adapter can transform every current Snom D3xx and D7xx phone into a WLAN device. WLAN functionality is increasingly becoming a frequent solution in offices where mobility and wireless connectivity is important. To use Snom devices without getting tangled up in network cables, our customers previously had to install other manufacturers’ WLAN sticks. These were not specifically created or optimized for use with Snom phones resulting in some difficulties implementing them or in the worst case leading to network interruptions. All that now belongs to the past thanks to the Snom A210 WLAN-Adapter. This small, easy to use adapter is simply plugged into the USB port of the Snom phone and can be configured quickly directly on the phone. As soon as it is connected with the local WLAN network all of the device’s features and functions can be used – just the same as a cable connection! 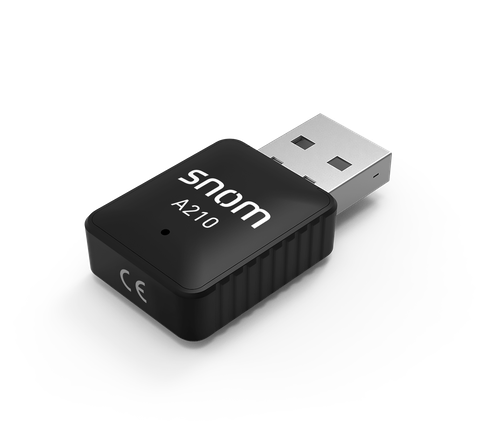 The Snom A210 WLAN-Adapter enables you to quickly, simply and cost-effectively set-up and use your Snom phone almost anywhere you want – even without a network connection. Please note: Only use the current V10 Beta-Firmware to install the A210.